A beautiful townhouse, located in the luxurious resort Coral Cay, has 4 bedrooms and 3 bathrooms with other amenities for 10 guests. Along with the convenience of space to share with your family and guests, as well as the privacy of your own. The home is in the proximity of tourist destinations, such as Disney World or Universal Studios. Get everything you would need for your vacation. Coral Cay Resort is the perfect getaway that offers excellent services and plenty of activities. Whether you are soaking in the relaxing spa, enjoying a casual morning walk around the lake or playing a game of billiards in the clubhouse; you will always feel right at home during your stay at Coral Cay. You'll also appreciate the added convenience of local shops, restaurants, and bars that are all within walking distance of the resort! For entertainment at home, there is a large LCD TV with DVD player and latest movie rentals. Also, a Nintendo Wii gaming console for whenever you are in the mood to play games. When it's time to prepare the perfect snack or a gourmet meal, the fully equipped kitchen offers all the amenities including a refrigerator, microwave, toaster, coffee maker, blender, pots and pans, rice cooker and lobster pot. So get ready to let your inner chef run wild in the highly equipped new kitchen. After an exciting day, you can look forward to spending some quiet time relaxing in the spa on the private patio. Get what you deserve! Welcome to Sweet Home Vacation! Established in 2010, we have welcomed thousands of happy guests to our homes. Our goal is for you to have the best vacation experience ever, and we strive to provide that every step of the way! If you have any questions, please feel free to contact us at any time and our Reservations Team will do our very best to assist you. We look forward to helping you find a beautiful home that suits your needs for your next Dream Vacation in Orlando area! Orlando Villas can be private homes for many families to rent out when staying in Orlando. Coral Cay is one of the well-known resort areas for a perfect family vacation. The location is close to theme parks and water parks for guests to travel easily. LOCATION LOCATION LOCATION! At just 6 miles away from Disney, Coral Cay Resort is literally just steps away from many world famous attractions in the Orlando area. While the gated resort is close to everything, it is a quiet location allowing you to relax when you want to stay away from the crowd. All my properties are fully equipped and even baby ready! If you have any questions, please don't hesitate to contact me for more info! All my 4 bedroom town homes inside Coral Cay have their own private hot tub and dining area in the private screened patio. There is also a queen sofa bed in the living area, so my 4 bedroom town home can sleep up to 10 guests! Being just 1 mile off HWY 192, Walmart and Restaurants are just a 5 minute drive away! Beautiful gated resort just 6 miles away from Disney. Features a clubhouse with pool, hot tub, and theater! There is a beautiful lake in the heart of the resort. There is a lake in the middle of the resort, a perfect place where you can have a picnic with your family or friends! We provide a telephone in the home with free long distance calls to U.S., Canada and Mexico. It can get pretty hot in Florida. You will definitely need the AC that is equipped in each room in this unit. We provide a heater in the unit, just in case you feel chilly. Fresh clean bed sheets and linens are provided for all the beds. There is a full-sized washing machine in the unit, so you can always dress in clean clothes. The home comes with a full-sized dryer, so your laundry will be easy! Parking space is available in front of the home. Working while vacation...? You will have access to high-speed wireless internet for free! Fresh clean towels are provided in the unit. All towels are professionally cleaned by the housekeeping team. Netflix night? High-speed wifi is available within the unit for you to enjoy! Enjoy watching TV or your favorite movie in the living room, gather with friends and family to create the best vacation memories! No need for hand-washing the dishes! Sit and relax after your full meal. The refrigerator is large enough to store food for the number of people who will be staying. It is also equipped with a water filter. The kitchen comes with stoves that is cleaned out frequently to help you cook comfortably. This home has a large oven that is cleaned out frequently to help you cook comfortably. The microwave is kept clean all the time to make sure your food tastes great! Coffee drinker? No to worry, you will have a coffee maker to start a fresh morning! Want to sleep in? Just throw in some bread in the toaster for a quick breakfast! The dishware and utensils are provided abundantly for people who will be staying at the home and their guests! This town home comes with a fully equipped kitchen with more than enough tools for you to cook up a nice meal for your friends and families. The town home comes with enough seats for people that is staying. Enjoy a nice dinner around the table with everyone! Enjoy our modern flat screen TV in the living room with your family and friends. If you bring your favorite movie from home, you can enjoy a movie night using our DVD player! The club house features a game room and even a theater room! A pool table is equipped in the game room. We provide Nintendo Wii game console in the unit, so you can take your eyes off your kids just for a while and relax. The town home comes with a cozy front yard with a beautiful lake view. You can enjoy a barbecue or relax in the hot tub at our private spacious screened patio. Coral Cay resort offers a pool with a beautiful lake view. It also has a kiddie pool and a playground. The pool area has a hot tub where you can soothe your aching legs from walking around in the theme parks. This is a self-served unit. We recommend all guests to purchase daily necessities prior to your arrival. We do provide the first roll of toilet paper and simple hand soaps for each bathroom.Towels and linens are also provided. Our home is baby friendly! Crib, high chair and stroller can be provided upon request. We also offer BBQ grill and pool/spa heating to make your vacation more enjoyable. Please let us know if you are interested. We also offer discounts on official tickets for theme parks and car rentals in Orlando. Please feel free to inquire! Hi Ximena, we are sorry to hear that our home was not of the quality you expected. Coral Cay resort is actually one of the popular vacation homes in the area for its affordable price and perfect sizing for smaller groups. We have over 2,000 homes in Orlando ranging from 3 bedrooms to 12 bedrooms. Please let us know if you are looking to book a future stay, we do offer return guest discounts. Thank you again for booking with us! I would rate the accomodations as average or adequate. There were several minor things that I feel need the attention of the owner. 1. The driveway area is too small for a truck, which is what I drive. I had to back my truck into the shrubs against the building just to get it off the sidewalk.2. The hot tub was in need of a new motor as 2 different maintenance men stated. But, no one came to replace it. 3. The dishwasher made so much noise, we chose to wash dishes by hand rather than listen to it. 4. The overall cleanliness of the place was not good. My wife mopped the floors two or three times before they were clean. 5. The bathtub in the first floor bathroom was clogged and would not drain.6. The theatre in the clubhouse was not easy to use either. The remote didn't work with the DVD player. 7. We replaced batteries in the clock in the kitchen as well as the remote for the tv (and the tv in the clubhouse) 8. The screens in the hot tub area at the back of the house were torn in several spots.9. The bracket for the door stop on the screened porch was broken. None of these issues, in and of themselves, were major issues, but taken in their entirety they made for a less than a enjoyable experience. Hi Karen, thank you for leaving a review of the home you stayed at, we value your feedback. We are disheartened to hear that you had some issues during your stay and would like to apologize for the inconvenience. We understand that we were able to have the property management deal with some of these issues you stated during your stay at our home. As for the cleanliness of the floors we will be scheduling a deep cleaning for this home to address the dirty floors you described. The issues you described in the club house are reported to the resort staff and as such there is not anything for us to do directly with them. Again we apologize that the home did not live up to your expectations. Thank you for booking with Sweet Home Vacation. Good place to stay, nice and quiet but needs some updates. I really like the place and amenities of the comunity, my family and puppy were very confortable, it was pretty quiet and we had everything we need. The only thing is that the place needs some updates, the patio screen and some things in the place were broken, the TV and WII controls had no batteries, no games at all for the WII and almost no channels to watch, besides of that we had a great time. Thank you for your valuable feedback, as it is important for us to improve and make every stay, a better stay for our guests. We have since passed on the notes to the management team and they are currently working on updating the unit. We also made sure that the issues with the TV controls and the gaming console are resolved. We would be happy to welcome you back to one of our homes with a special return guest discount. Thank you again for booking with Sweet Home Vacation and it was a pleasure hosting your stay. Property is okay but needs updating. Six of us stayed at this condo for four nights. Enough bath towels and hand towels were provided to last for one day but no washcloths were provided at all. Toilet paper, shampoo, and bar soap were provided to last one day. We had to go to Walmart to buy washcloths, toilet paper, bar soap, shampoo, and laundry detergent. We had to wash and dry towels everyday so everyone could take a bath. I have never stayed at a place that didn’t provide washcloths. Thank you for your precise feedback. We apologize for the inconvenience you had with the washcloths, we have since notified our cleaning team in regards to providing washcloths and other starter items to make our guests feel more at home. We hope to be able to host your stay again in the future with a special return guest discount. Thank you again for your business and your feedback. In need of some maintenance. We stayed at Coral Cay due to the hurricane and appreciate their allowing our pets. The property is more of a brownstone type build than a condo. You park directly in front of the unit in a small driveway. Two cars fit tightly and there is no street parking. The place would be fine if you were only there to eat in the morning and then off to the parks all day. I would not wish to stay if I was going to use the pool in that the whole complex did not have a vacation feel to it at all. It is more like a neighborhood. The price was right though and the place held up to Irma. We have notified our maintenance team to go over the unit. We hope you had a comfortable stay, and we pride ourselves on pricing our units correctly based on the location and feature set. We do offer return guest discounts, in which you can contact us and we'd be happy to offer you some of our units in other resort communities. Thank you again for your business and feedback. We were pleased with this property. Since we spent most of our time in the parks, this property was just what we needed to rest and recharge. 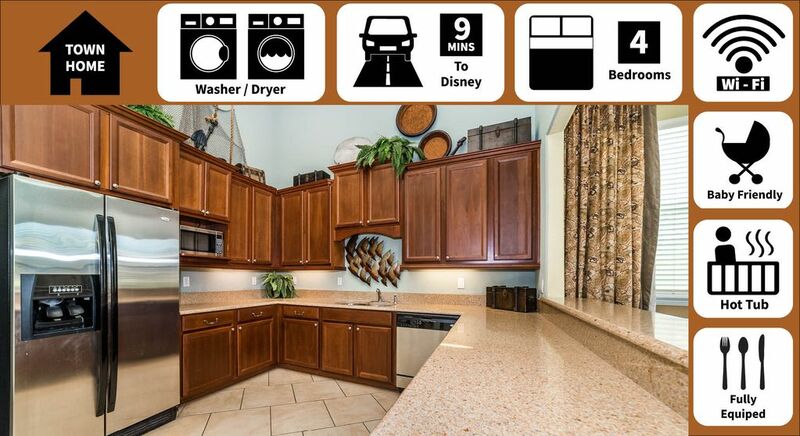 Situated less than 6 miles from Disney World, Coral Cay Resort in Orlando is an ideal location to unwind and enjoy the excitement of the world's favorite vacation spot. Just minutes from Orlando's vast array of theme parks, fabulous dining options and world-class shopping, Coral Cay Resort is the ideal home base for your next vacation, winter getaway or extended business trip. Each of Coral Cay's luxurious town homes has been designed from the ground up to provide a comfortable Florida lifestyle in spacious, well-appointed surroundings. Attractions in the area include Disney Magic Kingdom, Disney Animal Kingdom, Universal Studios, Downtown Disney, Disney World, WDW, Walt Disney World, Epcot, Kennedy Space Center, MGM Studios, and more!